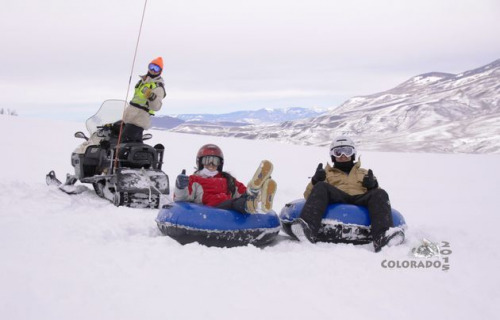 Now you can double your winter vacation fun by adding Snow Tubing to your Colorado snowmobiling adventure! During your beginner, family-friendly 2- or 3-hour guided snowobile tour, you'll get to play at a 1,050-foot-long tubing hill. Your guide will tow you in your snow tube up the hill with his snowmobile, so you can have the rush of whizzing down the slope - by yourself or holding onto your friends in their tubes. You'll also have the chance to enjoy a 3/4-mile-long oval track on your snowmobile, sip hot cocoa at the Cocoa Cabin overlooking Eagles Nest Wilderness, and let your kids take a spin on the special kids snowmobiles. Visit MYSNOWMOBILETOUR.com today.